Amir Coffey is good to go. That’s arguably the most important step so far this offseason toward helping the Gophers bounce back in Year 6 under Richard Pitino. The 6-foot-8 junior guard learned from doctors last week that he was fully cleared for all basketball related activities, according to sources. Pitino also told CBSSports' Jon Rothstein on Monday that Coffey was cleared. Coffey missed 14 games with a right shoulder injury last season, sidelined for the last nine games after surgery. The Gophers finished 15-17, including going 2-10 without him. He won’t get the same preseason attention this year coming off an injury, but it’s hard to overlook Coffey’s talent when he was on the floor for the U the last two seasons. After being named to the All-Big Ten freshman team in 2016-17, Coffey was a preseason all-conference selection with senior guard Nate Mason going into his sophomore year. The Hopkins product didn’t disappoint with 16 double-figure scoring performances, including his last 13 games. Coffey averaged 14 points, four rebounds, three assists and shot 37 percent from three-point range in 18 games in 2017-18. The highlight was his 23-point effort in a loss against No. 10 Miami (Fla.) in front of several NBA scouts at the Barn. What makes Coffey an intriguing NBA prospect is his versatility at 6-8. He can knock down shots beyond the arc, score off the dribble and turn steals into dunks on the fastbreak. But he can also grab a rebound and immediately take the ball down court to find open teammates or finish himself -- like a lead guard. Most of his numbers increased from his freshman to sophomore year, but surprisingly Coffey made the most impact as a facilitator playing primarly at small forward. His 3.3 assists per game ranked second on the team to Mason’s 4.2. The Gophers were 10-0 last season when Coffey had three assists or more in a game. That could be a glimpse into how Coffey will be used by Pitino this season. 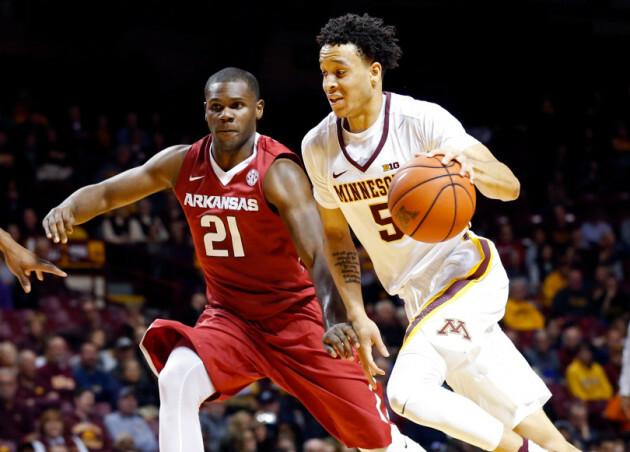 In a pick-and-roll heavy offense, the Gophers will need arguably their best returning passer to be a primary ball handler. Coffey’s vision and size to see over defenses becames a major advantage. In limited practice reps at the end of July, Coffey spent time at the point guard spot with sophomore Isaiah Washington playing off the ball. This might indicate seeing Coffey this season with the ball in his hands a lot more than in his first two years, especially compared to last season. In 2017-18, Coffey time spent as the pick-and-roll ball handler only 10.8 percent of his offensive possessions, down from 22.1 percent as a freshman, per Synergy Sports data. Pitino hinted during the offseason at Coffey's role possibly being different. Is point guard or point forward? We'll see when practice opens in a month. Senior guard Brock Stull, a Wisconsin-Milwaukee graduate transfer joining the team soon, could potentially share point guard duties. Pittsburgh transfer Marcus Carr will sit out this season if his waiver to play immediately is denied by the NCAA. “Every guard that we are bringing in to this program, we want them to be versatile,” Pitino said. “Amir can handle at the guard position, Isaiah is still going to take a little time, and Brock is versatile in what he can play." Coffey wasn't worried about where he will play this season when talking about his injury recovery this summer. -- Freshman Daniel Oturu told Pitino last month he felt like he was ready to play coming off shoulder surgery, but he's not fully cleared yet, per a source. Neither is redshirt sophomore Eric Curry, who missed last season with a knee injury. The Gophers' first official practice for the 2018-19 season is Sept. 26. Oturu and Curry are likely to compete for the starting center spot this season. -- Coffey entered college just under 190 pounds, but he's up to 210 this summer. That added strength should help him be more durable this season. He will face contact with his playing style. Coffey ranked second on the team with 4.6 free throw attempts per game.